I am very excited to announce the Spinal Pelvic Stabilisation programme is now available in Australia. Nearly 60 years ago in the USA, my father, Dr Monte Greenawalt, a chiropractor developed the first pair of Spinal Pelvic Stabiliser®. These were the first custom-made fully flexible foot insole designed to stabilise the feet in a better position of biomechanical function assisting chiropractic adjustments to hold longer and better. Now the Spinal Pelvic Stabilsing program is taught in chiropractic colleges around the world and many chiropractic techniques recognise this type of stabilisation of the feet to be an integral part of care for specific patients. Stabilise: Recognising instability problems and learning which spinal pelvic stabiliser to prescribe Rehab: Recognising muscular imbalances so you can easily prescribe the precise exercise and rehab. I am proud of the extensive knowledge we have built upon in these tracks and believe it will help you apply an integrated systems approach for your patients so that restoring and maintaining their optimal health is more complete. Through research we are just starting to understand why they work so well! 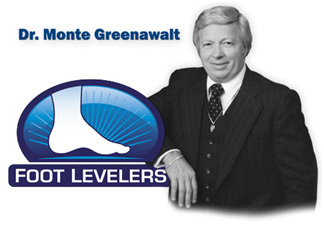 President of Foot Levelers Inc.